The Polish American Football Association (PZFA) was recently awarded 400 complete sets of equipment for junior players after winning a competition run by the International Federation of American Football (IFAF). The equipment was sent to 15 Polish clubs. 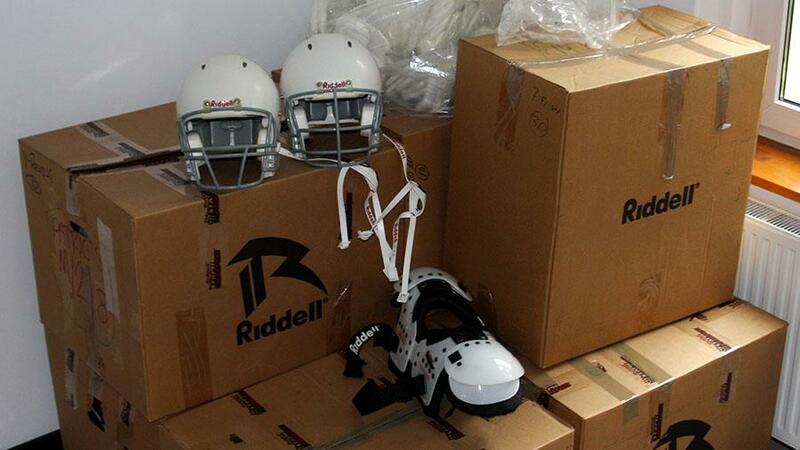 Each set of equipment includes a helmet and shoulder pads, as well as pads for the thighs, knees and hips. With the difficulty in Poland of acquiring football equipment in junior sizes, the support provided by IFAF in this area cannot be overestimated. The award was also made possible by the American sporting goods company Riddell. Before the equipment was sent by two-ton container from Birmingham, Alabama to Gdynia, it underwent a major renovation. Thanks to this, the helmets and pads now meet the most stringent safety standards. The Riddell Revolution helmet, popular in the USA thanks to the excellent protection it provides, was included in each set of equipment. While the value of this protection is priceless, it is worth mentioning that a new Revolution helmet costs about $150 in the USA. - The IFAF grant will provide a great stimulus to the development of junior football in Poland. I had the opportunity to see the equipment and it is in excellent condition. In the name of the Gdynia Seahawks, I would like to thank (PZFA) President Jędrzej Stęszewski for giving our juniors this wonderful opportunity - commented Maciej Cetnerowski, Head Coach of the Topliga's champion team. - It is surely a step in the right direction. Football in Poland will gain 400 new followers with this new equipment, and more will surely follow behind them - added Cetnerowski. - I would like to thank IFAF Presidium and IFAF President Tommy Wiking for their trust. Our this year’s big event - NAC SuperFinal VII played at the National Stadium in Warsaw in front of 23 000 spectators - was followed by the first junior tournament in Poland. We are not resting on our laurels, and we are determined to pursue further success - said Stęszewski. - I would also like to sincerely thank Jerzy Cetnerowski of MSC Poland Sp. z o.o., Marzena Przybysz of T.S. Transped Sp. z o.o. and Adam Ostrowski of Ref-con Service Sp.j. Thanks to them, we were able to reduce the cost of the shipping and storage, and the distribution of the equipment went quickly and smoothly - added Stęszewski. - The support of IFAF could not have come at a better time. On September 1 in Bielawa we conducted our first junior football tournament. Four teams, composed of younger players training with senior teams from throughout Poland, took part. The actual tournament was combined with a training camp including sessions with referees. Thanks to the equipment from IFAF we will be able to start a regular junior league next year. We are planning to organize it in the same format as our eight-man league. It is only through systematic work with our youth that our league may catch up with those of the European leaders - said Marcin Łojewski, the PLFA Director for Development of New Clubs. The equipment was distributed among 15 Polish teams, each of which received a substantial amount of equipment. Each of the following clubs received a set of equipment thanks to the grant: Bielawa Owls (PLFA I), Bydgoszcz Archers (PLFA 8), Wrocław Devils (Topliga), Wrocław Giants, Gryfici Szczecin (PLFA II), Kozły Poznań (Topliga), Kraków Kings, Olsztyn Lakers (PLFA II), Patrioci Poznań, Gdynia Seahawks (Topliga), Toruń Angels (PLFA II), Tychy Falcons (PLFA II), Warsaw Eagles (Topliga), Warsaw Spartans (PLFA I) and Zagłębie Steelers Interpromex (PLFA I).